The official moratorium on deepwater drilling in the U.S. Gulf of Mexico was lifted in October 2010, but has been replaced with what can only be described as a quasi moratorium as new permits continue to languish in a byzantine approval process that has frustrated the industry. Investors and industry participants have every reason to be confused. On Monday, The Wall Street Journal reported that major players did not expect new permits to be issued until late 2011 or 2012. This was followed today by another article in the Journal indicating that certain projects could receive a go-ahead within weeks. It seems like the Obama Administration either does not know how to proceed or an internal power struggle is taking place as competing interest groups influence policy. Regardless of the reasons behind the quasi moratorium, the end result has been an atmosphere of extreme uncertainty for oil and gas industry executives and for investors. However, if a silver lining can be found in this situation, it is that investors willing to do the work may be able to identify opportunities in the sector that have escaped those who are preoccupied with the ongoing regulatory chaos. The companies in this group have all rallied significantly over the past six months with one notable exception: Diamond Offshore is essentially flat from the time of our initial profile on the company. Mr. Market clearly does not like Diamond Offshore, but has he spotted a real concern that justified this lack of participation in the rally or is the disparity a potential opportunity? We encourage readers to review the original profile on Diamond Offshore from July. At the time, we were impressed with the company in terms of the operational results and quality of the rig fleet but had concerns regarding the fact that the vast majority of revenues were attributed to high specification floaters of the type used in deepwater activities. 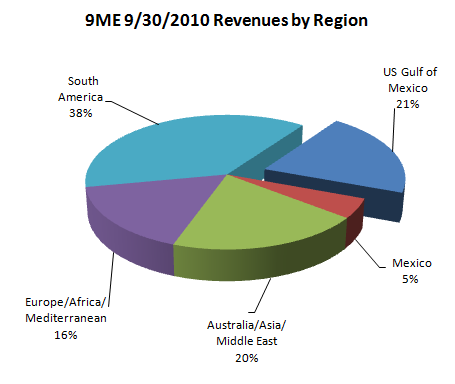 Another concern involved the percentage of revenues attributable to activities in the Gulf of Mexico. Although the company had already started to reposition rigs to other parts of the world, it seemed that the company still had a higher risk profile compared to Ensco and Noble Corporation. Management has been able to shift three rigs to other parts of the world where they are currently in revenue generating status. Only five rigs remain in the Gulf of Mexico. 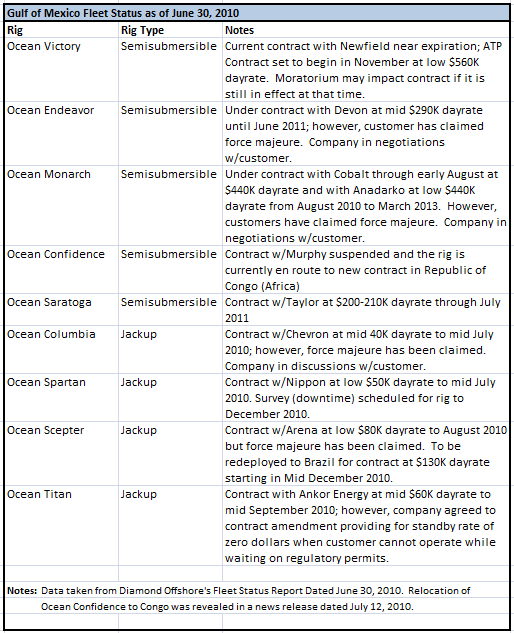 The most significant issue at this point is the status of the Ocean Monarch which has been contracted to a customer that claimed force majeure due to the moratorium and the matter is the subject of a lawsuit. Based on the data presented above, it seems quite clear that management has taken proactive steps to shift resources out of the Gulf of Mexico into other areas of the world. Obviously, the fact that rigs have been moving out of the Gulf of Mexico is not reason for celebration when considered in isolation. The company needs to find productive work for these rigs in other parts of the world. 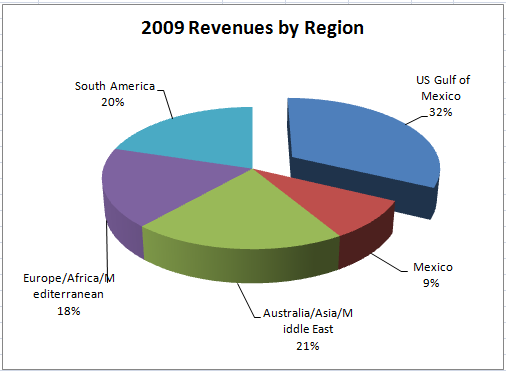 How has performance in 2010 compared to the company’s operating results in prior years? Have results fallen off the cliff in the first nine months of 2010? This does not appear to be the case based on the data. While margins are compressed for all rig classes compared to the same period in 2009, we can see that management was able to reposition rigs in a manner that significantly mitigated a 45 percent drop in contract drilling revenues in the Gulf of Mexico. Overall contract drilling revenues were down under 10 percent thanks to a significant increase in activity in Brazil in 2010 compared to 2009. While margins were under pressure, all things considered, the company seems to have navigated turbulent times quite well. As investors, we must make decisions based on imperfect information amid uncertainty. 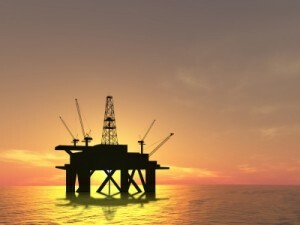 The situation in the Gulf of Mexico is about as uncertain as possible and, despite rallies in some contract drilling companies, the overall group is still trading at depressed valuations. This is particularly true in the case of Diamond Offshore given the stock’s lack of participation in the sector’s rally over the past six months. 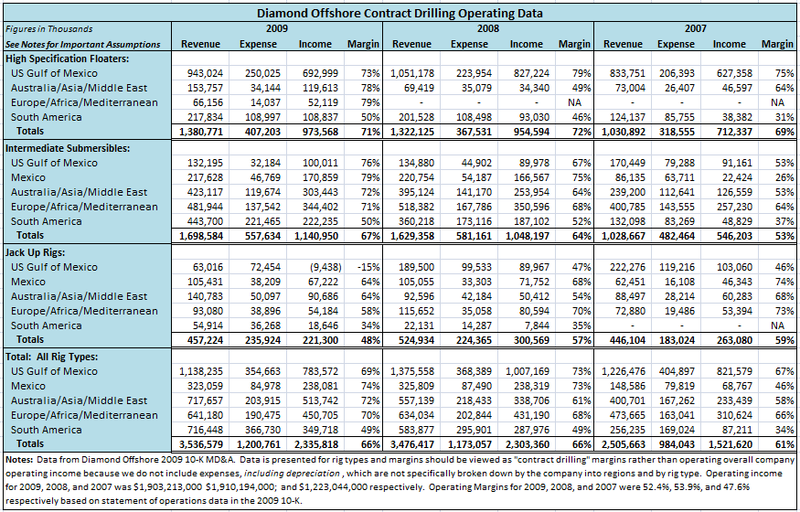 While Diamond Offshore has a heavy exposure to deepwater exploration worldwide, the company has diligently reduced exposure in the Gulf of Mexico and operating results for the first nine months of 2010 were strong, all things considered. 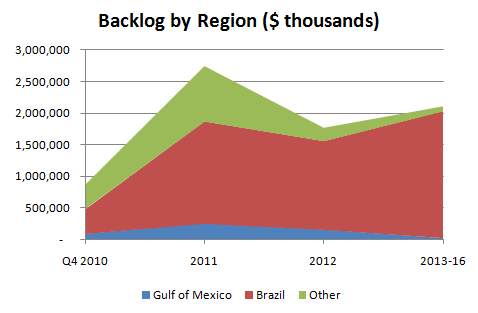 While the percentage of backlog attributable to Brazil is a potential risk, it still seems preferable to enduring high exposure to a very uncertain Gulf of Mexico policy environment. 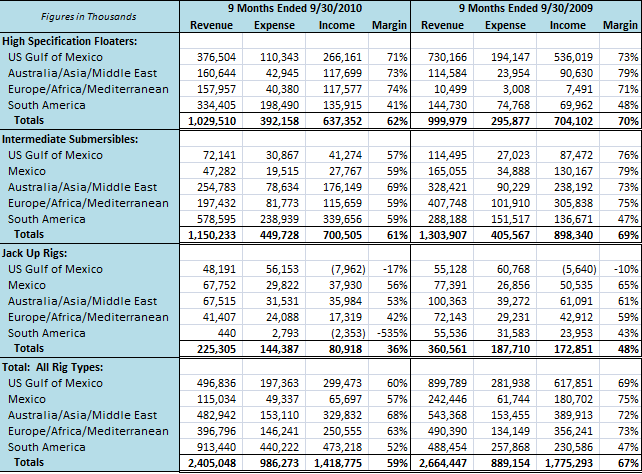 If we annualize free cash flow for the first nine months of 2010, we arrive at a figure of approximately $850 million. Shares are currently trading only slightly more than ten times the depressed free cash flow levels of 2010. Diamond Offshore is controlled by Loews Corporation which owns 50.4 percent of shares outstanding. Loews has long been known for intelligent deployment of capital to wholly owned and partly owned subsidiaries. As we can see from deployment of free cash flow in the past, Loews has been willing to either opportunistically deploy free cash flow toward expansion capex or return cash to shareholders through special dividends. As a result of future volatility in dividend payments and timing, it may be best to own Diamond Offshore in a non-taxable account. 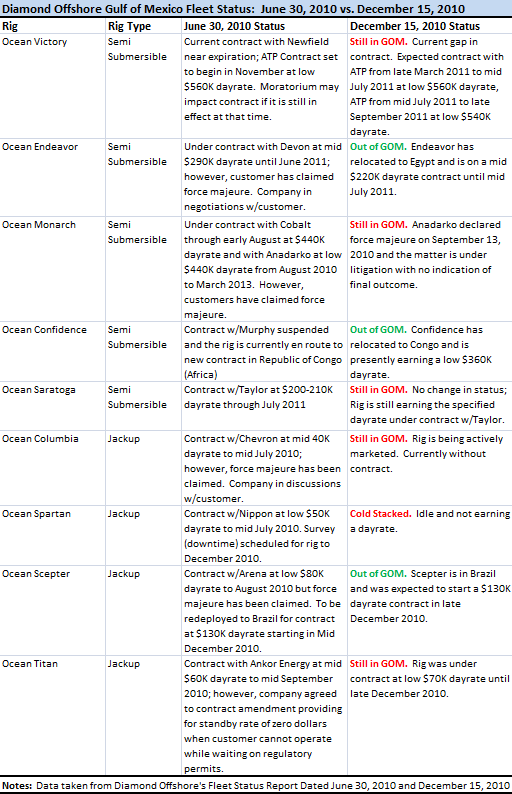 Disclosure: The author recently purchased shares of Diamond Offshore and also owns shares of Noble Corporation. In any case, the discount to the overall sector may be gone but it still seems like a good hold, along with Noble (which was added to the S&P 500 today and has had a nice run-up as well). However, at these levels there is somewhat more risk of an unexpected pullback in oil prices impacting the entire sector. Some people seem anchored on pre-Macondo prices for the drillers as a potential target, with the idea that at that point the special situation of profiting from the market’s irrational punishment of the entire group will then be gone. This is not necessarily a valid argument since oil is now much higher than April of 2010 and seems likely to support the sector. However, holding the stocks based on oil price projections becomes more of a speculative venture than a value opportunity so at some point a continued advance in these shares should result in taking some money off the table. Perhaps $45 for Noble and $85 for Diamond Offshore. Any thoughts on exit points?